Before I start, I want to be clear that this will not serve as an advertisement for any company and I won’t be targeting any company specifically as either good or bad. The purpose is to impart the knowledge I have gathered on the subject in general and pass that on to help you make better and more informed decisions. Those that know me or have followed the numerous threads on LEDs here know that until recently I was almost completely against LEDs as reef lighting. Not because I thought the tech was bad, but more because I felt the tech hadn’t caught up to our needs or rather the needs of our tanks, plus some of the colors were just nauseating and fake looking. I feel it’s a responsibility to my business and my customers to stay on top of information on these new trends or technology as they unfold in the hobby. Since the LEDs first showed up I have stayed in the loop but remained on the sidelines until I was comfortable enough to get involved. The initial problem for me was that the first few companies on the scene had wild claims but they all had different standards and when you spoke to them everyone else was doing it wrong but they had it right. There was no way to verify any of the claims and even though many of the fixtures looked the same they were all different depending on whom you asked. So I sat and watched things unfold, as some companies came and went and new ones joined the pack with “newer” technology and “features”. It became incredibly frustrating as I knew the technology was there but nobody had the proper execution or information I was happy or even comfortable with. It was having a brand new GT500KR in the driveway but no keys in sight frustrating (perhaps a little much but you get the point and your Camaro is not nearly as awesome, it’s not even worth arguing). With everyone pointing fingers and all the different information who was I to trust? As with any new tech wave there were throngs of “me too” companies peddling knockoffs or inferior versions of some of the better brands and eventually the herd was culled as the weak fell. It still seems like every day there is a new company with a new light and it can be overwhelming to keep track of all of them. For me, I need numbers. I need a company that can back up their claims with actual research and not only be able to show me that research, but apply it to tanks since some of the larger builds require a lot of planning and you need to be able to calculate spread and useful light at depth ahead of time. I can count the number of companies that have been able to produce this level of information on less than one hand. My needs may be a little more extreme than a regular hobbyist but the level of knowledge should still be important to anyone looking to purchase LEDs for their reef. Visible color is meaningless, the lights need to be able to support photosynthesis. Corals might look fake awesome under incredibly blue light but it isn’t always beneficial. When dealing with a technology based on efficiency that is constantly advancing, “wattage” is a meaningless measurement. LEDs can range in efficiency and a lower wattage diode can produce far more useful light than a higher wattage unit and as the tech advances this divergence will be even greater. Some companies also underdrive their LEDs at lower wattages to produce even less heat but still crank out beneficial light better than some other fixtures. You get what you pay for. 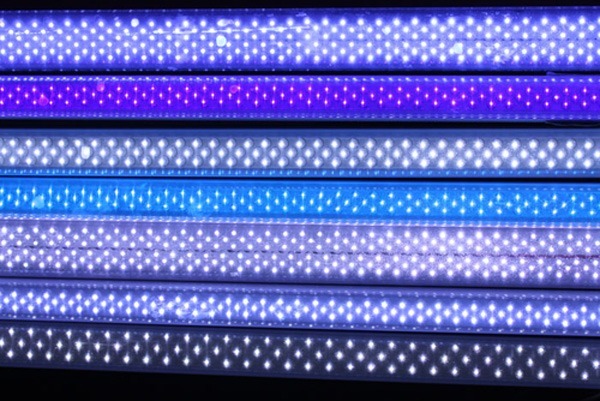 LEDs are still fairly new and as newer and better products come out the prices will remain somewhat elevated for a quality unit where as the cheap knockoffs will end up costing more when you eventually realize that you need to upgrade to the better units anyway. Not all LEDs are created equal, not even close in some cases. While Cree and a few other well known names can sometimes be a safe bet, there are plenty of companies using cheap LEDs that are almost useless. “WOW that’s bright” does not equate to “WOW this must be a great fixture”. LEDs are bright but without quality diodes or the right optics for your setup some won’t penetrate much useful light past the first few inches of water. Quality build. it may sound superficial but if a fixture looks well constructed than odds are the company at least cares enough to not want to be perceived as producing garbage. This isn’t always the case but it does warrant a second look most of the time. Look for innovation. The companies who are producing full lines of LED products for tanks and who are producing new products deserve your attention. The few companies I have been dealing with are always working on something new, pushing the technology forward instead of just boxing up the same crap everyone else is producing. Wild claims are all over the place. If something sounds too good to be true and doesn’t cost that much than odds are you are getting taken for a ride. This also goes under the available information. If a company can’t back up their claims with hard data than just move on to the next one. Customer service is a huge point for us. There are companies that are quick to reply and keep in contact at all hours which is great. I don’t expect everyone to reply to me at 2am but if I reach out a few times with no contact whatsoever after even a few days than I don’t deal with them. One of the biggest selling points for us, when it comes to LEDs, is the efficiency. It sounds obvious but a recent job I helped design is a 12?Lx5?Wx4?T roughly 1800 gal mixed reef for a public aquarium build. Rather than go with halides which would have required several thousand watts, which meant a large chiller, and yearly bulb replacements, we went with 100w LED pendants. Not only were we able to eliminate the need for a chiller and cut out the bulb replacements for at least the next 11 years, but the entire system would be powered by only 1200w of lighting (that’s thousands a month in savings for those keeping track). That’s insane when you really think about it because there are significantly smaller home systems around 200gal that are running at least that just in halides. My point is that while some LEDs seem very expensive and the urge to “save money” up front by going with cheaper and often inferior units sounds like a good idea, the light pays for itself either way so spending a few extra bucks up front will pay out in the end. In the end the choice is ultimately up to you but I would stress that you conduct your own research on the lights you are interested in and be objective. It can be hard to have your heart set on something and have to wait to find the right one but jumping the gun and buying the first light you find can be disastrous.